Bill and I met, fell in love, and married in 1992. We are very happy to share our lives and faith, after each of us had unfortunate experiences that are best left in the past. We had eight children between us, who have now "grown up" and moved out, except the youngest, who returns during his breaks from college. We now have three married sons, three married daughters, five adorable granddaughters and three gorgeous grandsons. Life is grand!!! Bill didn't want us to have any more babies, so now I have my dogs (and grandkids) to lavish attention on. He can't complain about my spoiling them, though, because he is just as guilty of that as I am! Sal - a dalmatian born in Feb. of 2003, who belongs to our oldest son, Micah. Dena, Longrun's Legendary Mission, JC - a girl born into my own hands on Sept. 23, 2002. Mazie, Longrun's Amazing Grace - a girl born to us on Sept. 21, 2004. Starman, Longrun's Silent Night - a boy, littermate to Mazie. Selena, Longrun's Belle Notte - littermate to Mario, lives with co-owners Evan & Leah Lamb. Joy, Wyndancer's I Got The Joy - our first whippet, stealer of our hearts. Read about her here. Smooch, SaeSi's Nation'l Nokout O' Abidjan, CGC - a beautiful male borzoi. Nov. 27, 1996 - August 26, 2008. Way to go, Dena Baby! 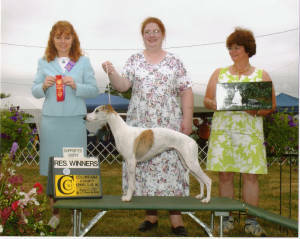 I love working with and showing my beautiful whippets, especially when they win!!! There are more of my favorite links on the page titled: Favorite Links. Really? !